Given the huge influence that Napoleon Bonaparte had during his lifetime, it’s not surprising that his ghost has popped up from time to time since his death. The Museum of The Black Watch has transcribed a letter describing a British soldier’s encounter with Napoleon’s ghost during the removal of Napoleon’s remains from St. Helena to France in 1840. Albert Dieudonné, who played Napoleon in Abel Gance’s 1927 film of that name, talked about spooking a night watchman at the Château de Fontainebleau who claimed to be visited by Napoleon’s ghost. The following story about Napoleon’s ghost first appeared in British newspapers in January 1832. At the Mansion House on Saturday, M. Pierre de Blois, a French gentleman who resides in chambers in Leadenhall Street, was summoned before the Lord Mayor for beating Rafael Spaglietti, an image seller, and breaking a very fine bust of Napoleon Buonaparte. 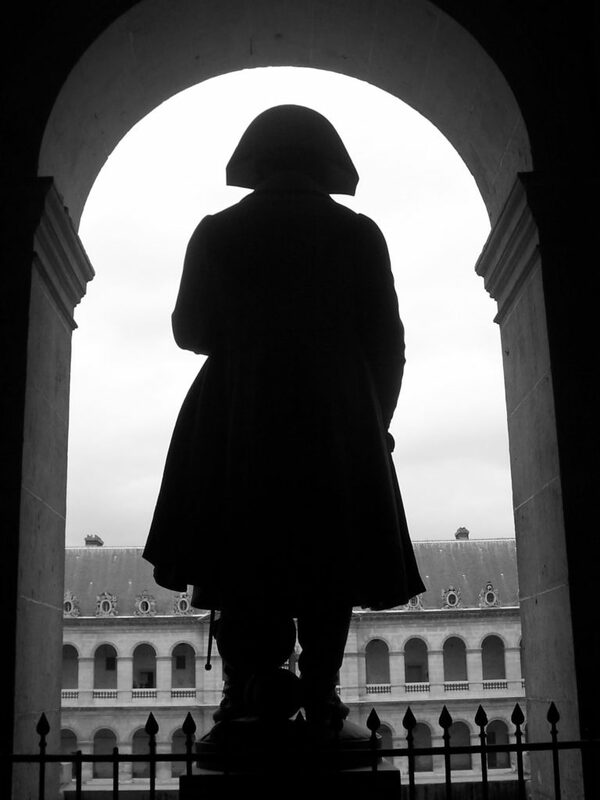 It appeared that the Italian went upstairs to the defendant’s room door, at the top of which there was a glass; he raised up the head of the image, which was made of pale clay, to the glass and said softly, ‘buy my ghost of Napoleon.’ M. de Blois, who had known the Emperor, thought he saw his ghost, and exclaiming ‘Oh, Christ, save us!’ fell on the floor in a fit. The Italian, seeing no chance of a sale that day, went away and returned the next. M. de Blois, in the meantime, had recovered from his fit, and hearing how his terror had been excited, felt so indignant that the moment he saw Spaglietti at his door the next day, he flew at him and tumbled him and the Emperor downstairs together. Did Napoleon believe in ghosts? For the answer, see my post about whether Napoleon was superstitious. Charlotte Brontë seemed to think so. She wrote a short story called “Napoleon and the Spectre” (published in The Green Dwarf, 1833), which you can read for free on Project Gutenberg. How was Napoleon’s death reported? Providence Patriot (Providence, Rhode Island), March 28, 1832. British papers carried a longer account. It is important that de Blois was said to have known the Emperor. Whether it was true or not, this comment lends credibility to de Blois’ extraordinary response. Indeed! I haven’t been able to ascertain what Pierre de Blois’s connection with Napoleon was. Maybe another reader will know. Your website is wonderful and I love reading your articles. But I have one question you may have not looked into on your site. if so I did not see it. Why did Napoleon put his hand in his pocket? His right hand? Stalin, Lenin, Wagner, General Sherman, McClellan, George Washington, Marquis de Lafayette, Marx, and hundreds of others. All these men did the exact same thing. So I just wondered your opinion. Thanks, Jeff. I’m glad you’re enjoying the site. The “hand-in-waistcoat” has been considered a fashionable pose for gentleman’s portraits at various times in history, which is why you find so many examples of it. Tom Holmberg provides more details about this on the Napoleon Series: http://www.napoleon-series.org/faq/c_hand.html. Thank you for explaining his gesture Mrs Selin! He’s far too busy haunting France to be bothered with the likes of us Brits ! M. de Blois, who had known the Emperor, thought he saw his ghost, and exclaiming ‘Oh, Christ, save us!’ fell on the floor in a fit.